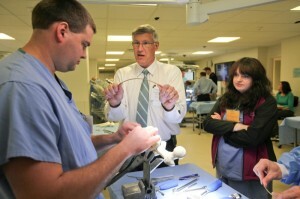 Working with synthetic “saw” bones and cadavers, about 80 orthopedic residents from Ohio and Pennsylvania recently received two days of hands-on training led by Akron Children’s nationally-ranked pediatric orthopedic surgery team. Neither stage lights nor costumes were needed on Tuesday for impromptu performances in Akron Children’s Hospital’s cafeteria and Perkins Square Park. A string quartet from the Akron Symphony Orchestra quickly set up their instruments as five dancers from Ohio Conservatory of Ballet performed as part of the Knight Foundation’s Random Acts of Culture™ program.